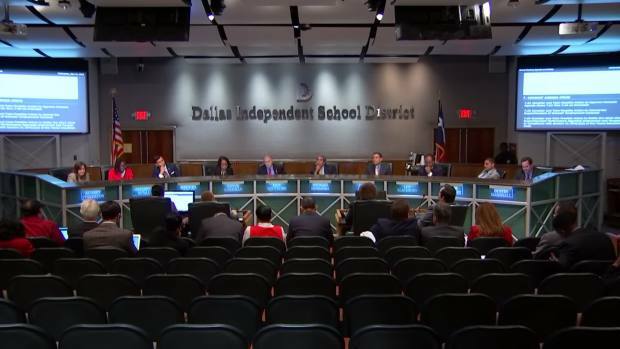 Dallas Independent School District board members voted down a proposal Wednesday night designed to put the district’s long-time bus contractor on notice. But Dallas ISD administrators said they are still moving ahead with a plan to look at other bus companies with the current bus contract up for renewal next semester. From school buses running late – causing students to miss class – to hundreds of bus drivers running red lights, some Dallas ISD board members have big concerns with their current bus contractor Dallas County Schools. Right now DCS is the only Dallas ISD vendor of any kind mentioned by name in Dallas ISD policy. Parents at a Dallas Independent School District board meeting voiced their concerns and opinions regarding a plan to look at potential school bus operators Wednesday night. The debate at Wednesday's meeting was whether to take away that preferred provider status in a largely symbolic move to send a message that DCS must improve. Dallas ISD Trustee Dustin Marshall said DCS has been granted a virtual monopoly, saying the school district has not put busing out for a competitive bid in 15 years. "I think this is a situation where we have got to act in the best interest of our kids. We have got to ensure that our kids have a safe ride to school that arrives on time at an affordable cost," Marshall said. InvestigativeDallas Mayor Surprised by Punishment For Ex-DCS Board Pres. Other trustees debated whether the proposed policy change was the best way to deal with the concerns. Some noted that current policy still allows the administration to hire any bus contractor it wants, even while DCS is mentioned by name. Trustee Joyce Foreman addressed Dallas ISD Superintendent Michael Hinojosa directly, saying his staff should continue to push DCS toward improvement instead of casting them aside. The Dallas ISD School Board is scheduled to vote on a proposal Wednesday night designed to send a message to their school bus contractor, Dallas County Schools (DCS). "What I encourage you, Dr. Hinojosa, to do, along with your staff, is to work with Dallas County Schools, because they are our provider today," Foreman said. In a statement DCS responded to Wednesday night's vote saying, "We want to thank the Dallas school board for listening to the facts about our service to DISD families. We will continue to prove we are the best transportation provider for DISD. We have one of the strongest safety records in the State of Texas and an outstanding on-time rate for getting children to school on time. But our work is never done; we strive to improve our service every day." The Dallas ISD has hired a consultant to help administrators examine other bus contractors. On Wednesday night, superintendent Hinojosa re-iterated his belief that the district should continue to consider making a change. "The game changed this year with the issues that we are dealing with, so now it is appropriate for us to consider other options because of the services that we are getting," the superintendent said.